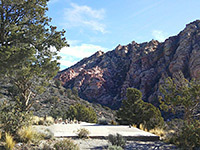 At the end of the short, paved section of Rocky Gap Road off the scenic drive in Red Rock Canyon National Conservation Area, Willow Spring is a good place for picnics, and is also one of the busier trailheads in the park, for routes ranging from the 0.15 mile Petroglyph Wall Trail that leads to a rock art panel, to long hikes into the rugged Sandstone Bluffs region, along the upper reaches of Red Rock Canyon. 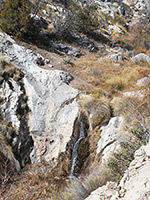 Another popular path, intermediate in length, is the La Madre Spring Trail, which follows the unpaved section of Rocky Gap Road for half a mile then forks off northwards, along a disused vehicle track through a bushy valley to the site of a dam along La Madre Creek (1.8 miles). The official path ends here, but a lesser trail continues, climbing more steeply to several other destinations including the spring itself, a waterfall, the remains of a stone cabin and several adits from an old mine. The Willow Spring trailhead is at the end of the half mile paved part of Rocky Gap Road, 6 miles from the park visitor center. 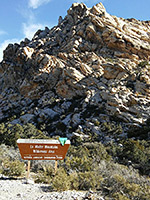 Facilities comprise restrooms and several picnic tables, nestled in bushy land at the foot of the White Rock Hills. 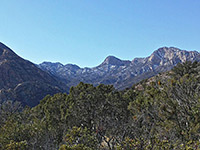 High clearance vehicles can drive another 0.6 miles along the road to the La Madre trailhead, where the trail branches off, at the boundary of the La Madre Mountains Wilderness Area. 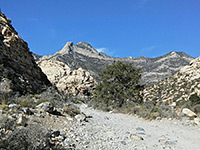 From the usual parking area at Willow Spring, the first part of the hike is further along Rocky Gap Road, on the northeast side of the wide, stony bed of Red Rock Wash, gaining height gently, past a fork in the canyon and out into a wide valley, where the path branches northwards, and the road bends south, into the upper portion of Red Rock Canyon. 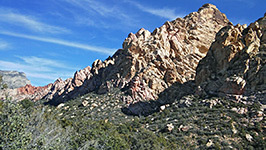 The valley is bordered to the southeast by the mostly white (deep red in some places) sandstone of the White Rock Hills, rising sharply to a series of cliffs, split by little ravines, and to the north by the much higher but more gently inclined grey limestone slopes of La Madre Mountain, all quite overgrown. 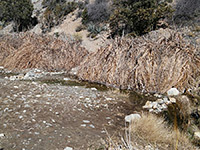 The path winds through the trees and shrubs on the valley floor, now on the west side of the streamway, and gradually moves further away, heading due north towards the tributary drainage of La Madre Creek. 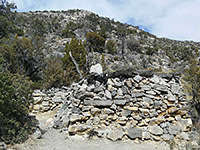 Several side paths lead back down towards the main streambed including the White Rock Loop, and after 1.5 miles the La Madre Trail arrives at the site of a former homestead, where the main relics are two concrete foundations. The old road (and the official trail) ends 0.3 miles further beside the creek, at the site of La Madre Dam - once a pretty pool, now just a muddy, brush-lined section of the creekbed where the waters fall over a small gravel rim. The narrower continuation path follows the ravine further upstream, through steeper, rockier and more overgrown surroundings, crossing the creek several times. The dispersed spring is reached after another quarter of a mile followed soon after by a 15 foot waterfall and then by the ruined (and partly restored) stone cabin, this 2.3 miles from the trailhead. The cabin was built by miners in the early 20th century, on the west side of the creek just above a flat, reed-filled area. The active excavation site (Emerald Prospect) is another 0.2 miles north and nearly 500 feet higher, and originally had six adits, two shafts and one pit, producing tiny amounts of copper, lead, zinc and silver, though not enough for proper production. 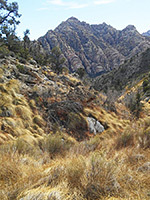 The mineralization is associated with the La Madre Fault Zone, which runs from the north end of White Rock Hills, across the creek at this point and northwest towards the crest of the Spring Mountains.